I really should be doing my assignments...I AM THE QUEEN OF PROCRASTINATION. Instead of spilling out poetry on paper here, I'll just have to save all my excitement and creativity for the swarm of papers that are going to take over my life in the next month. Does anyone else ever feel so swamped with work, that you never know where to start? ::lol:: Eventually you just get over it, bite the bullet, and poop out several essays. 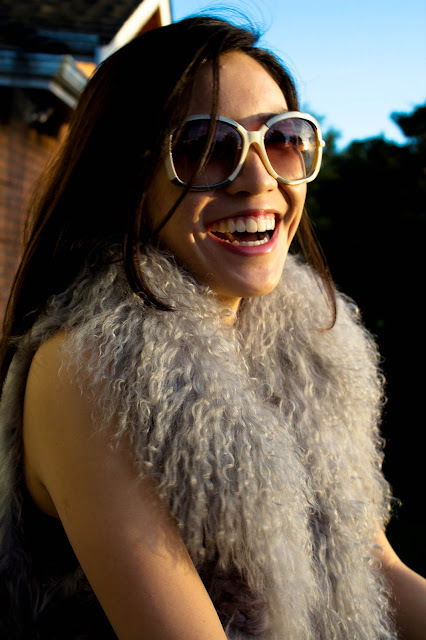 I'm loving this fuzzy Gaia Vest that I found in the depths of my mother and I's communal closet. It find myself stroking it absentmindedly throughout the day and its a bit funny to watch if I'm sitting around lost in thought, petting myself. To quote Agnes from Despicable Me "It's...it's so fluffy, it's so fluffy I could DIE!" Two Gold Rings From Childhood (inscribed with the character 福）, a bracelet from my grandmother, a Baume and Merceier vintage gold watch, and an Alexander the Great bracelet pillaged from the NY Met. Usually I tend to stay away from blingy gold jewelry, but if you're wearing purple and acting like a king, you might as well go all out right?